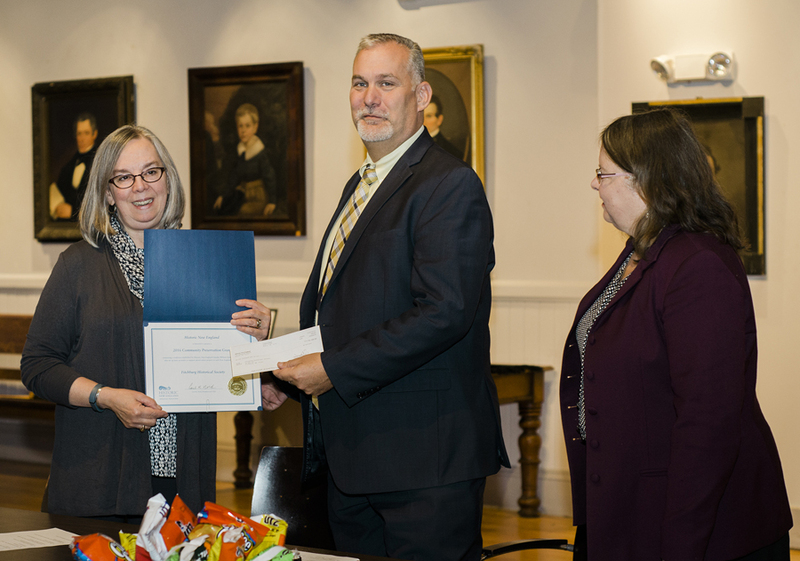 Sally Zimmerman, Historic New England’s senior preservation services manager, presented a Community Preservation Grant at a recent board meeting of the Fitchburg Historical Society. The $1,000 award will help the historical society match a 2016 Massachusetts Cultural Facilities Fund grant to update its master plan, create a schematic design, and get cost estimates and scope documents for the Phoenix Building, its headquarters on Main Street. The planning project is a necessary first step toward the historical society’s goal to complete renovation of the Phoenix Building, and to provide needed education and exhibition space and climate-controlled collections storage. The Fitchburg Historical Society shares the city’s history and serves as a source of local pride and identity. This is one of six projects throughout New England selected for a Historic New England Community Preservation Grant this year. Learn more and see a list of winners.